The main advantage of Halotestin is the price, which in comparison with other anabolics is quite low. The manufacturer is Dragon Pharmaceuticals. Produced in tablets of 50 pieces. Since Halotestin has a weak anabolic effect, it does not affect the rate of muscle building and does not fit bodybuilders striving for muscular growth. For this purpose, there are a number of much safer steroid agents. 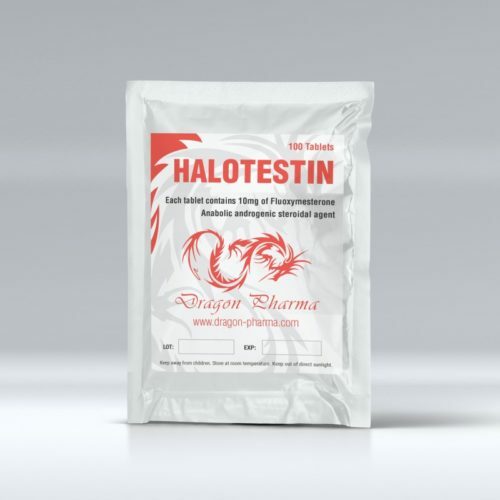 If you still decided to buy Halotestin for this purpose, do not forget to combine its reception with Testosterone esters or Nandrolone, or Boldenone, which will significantly improve the effect. The main task of Halotestin is to increase aggression and strength in the form of increased muscle density, and since the effect produced by Halotestin persists for a while, the drug should be taken daily for a full 2, 4 or 6 weeks. At the same time, its actions are enough after taking 5-6 hours a day. Before use, consult with your doctor. Since Halotestin, which can be bought at special sites, in some cases can have a toxic effect on the liver.